Are you still using a paper protocol? While paper protocols are readily available and multiple options exist, there is a great deal of evidence-based data that indicates that computerized “insulin-dosing calculators” provide better patient care….less frequent hypoglycemia, enhanced compliance with fewer errors, less nursing time and workload, and better overall glycemic control. A 2006 study by Taylor, et. al, concluded that “Despite extensive in-servicing before implementation of the protocol and frequent feedback to the greater than 80-member nursing staff, protocol violations were identified a large portion of the days patients were on insulin infusions”. Our own study of GlucoCare compared to a paper-based Yale protocol uncovered a substantial incidence of protocol deviations and errors that directly led to unwarranted hyper and hypoglycemia. 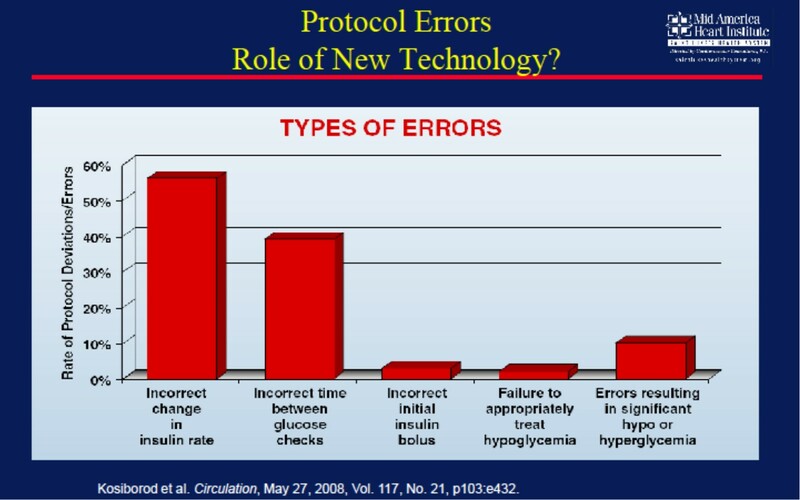 Bottom line….multiple evidence-based studies demonstrate that computerized protocols that assist nurses in the management of continuous insulin drips enhance patient care by reducing hypoglycemia and improving overall glycemic control. Taylor, B.E., et al., Efficacy and safety of an insulin infusion protocol in a surgical ICU. J Am Coll Surg, 2006. 202(1): p. 1-9. Kosiborod, M., et al., Hyperglycemia Management in the Cardiac ICU: Can computer-driven Glucose Control Protocols Reduce Errors and Improve Patient Safety? Circulation, 2008. 117(21): p. 103:e432. Cyrus, R.M., et al., Evaluation of compliance with a paper-based, multiplication-factor, intravenous insulin protocol. Ann Pharmacother, 2009. 43(9): p. 1413-8. Juneja, R., et al., Computerized intensive insulin dosing can mitigate hypoglycemia and achieve tight glycemic control when glucose measurement is performed frequently and on time. Crit Care, 2009. 13(5): p. R163. Lee, A., et al., Computerisation of a paper-based intravenous insulin protocol reduces errors in a prospective crossover simulated tight glycaemic control study. Intensive Crit Care Nurs, 2010. 26(3): p. 161-8. Oeyen, S.G., et al., Adherence to and efficacy and safety of an insulin protocol in the critically ill: a prospective observational study. Am J Crit Care, 2007. 16(6): p. 599-608. Rattan, R. and S.A. Nasraway, The future is now: software-guided intensive insulin therapy in the critically ill. J Diabetes Sci Technol, 2013. 7(2): p. 548-54. Saur, N.M., et al., Software-guided insulin dosing: tight glycemic control and decreased glycemic derangements in critically ill patients. Mayo Clin Proc, 2013. 88(9): p. 920-9.